Dramatic evidence from Tuesday's RHI inquiry dominates Northern Ireland's front pages on Wednesday morning. 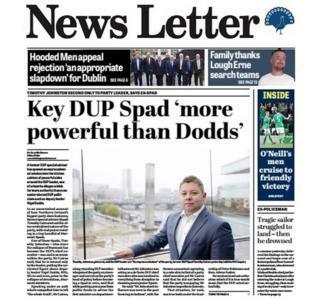 "Key DUP Spad 'more powerful than Dodds'" is the headline in the News Letter. It says former DUP special advisor Timothy Cairns has opened "an unprecedented window into the kitchen cabinet of powerful aides around the leader [Arlene Foster], one of whom, he alleges, wields far more authority than even senior elected DUP politicians such as deputy leader Nigel Dodds". In a double-page spread, it reports on "an unvarnished account of how Northern Ireland's biggest party does business", including Mr Cairns' claim that former Spad Timothy Johnston, who is now the DUP chief executive, was so senior within the party that he was "second only to the leader". The Belfast Telegraph's RHI headline quotes Mr Cairns as saying "I was prepared to change my story on Jonathan Bell to suit the party". The former special advisor has accused Mr Bell of bullying and violent behaviour towards him and other party officials, adding that he was so drunk in a New York bar that he was ordered to leave, allegations which Mr Bell denies. In an analysis piece, Suzanne Breen says "the party will struggle to recover from the devastating revelations". '"Grubby" DUP laid bare by ex-aide' is the headline in the Irish News. "DUP leader faces battle to keep political career alive," says its political correspondent, John Manley. Mr Manley writes: "The salacious and gossipy revelations, primarily concerning Jonathan Bell, have provided entertaining vignettes," however "more central in formulating the inquiry's ultimate narrative will be the aspects relating to Arlene Foster... who was never merely a spectator in this saga and can be linked to its spectacular failings at almost every juncture". In other news, the Irish News front page also carries the story of "Derry GAA legend, Eamonn Coleman" and how he was sacked a year after he managed his county to its first All-Ireland senior title. The 59-year-old died in 2007 after battling non-Hodgkins lymphoma. He managed his county to All-Ireland glory in 1993, but the following year was dismissed by the Derry county board, a move that "stunned the GAA world", the paper says. His neice, Maria McCourt, a former journalist and newspaper editor, has written a book that tells the full story in Colemans's own words through a series of interviews she carried out before his death. It reveals that weeks before the final, gardaí were called after former Derry captain Henry Downey was punched by a county board official in a row over tracksuits, and contains details about a 1994 phone call Downey received - while in America - to tell him that he had not been reappointed. 'In a Rail Jam' is the headline in the Mirror, which says Translink has found itself in "a sticky situation" over claims a worker is selling jam for Friends of Israel. It reports that several employees of NI Railways have complained to the company that the sales are being made during working hours and quotes a source as saying: "It doesn't matter if it's jam, flags or football teams - we have to be neutral." It says Translink denied the jam was raising funds for Friends of Israel - that the proceeds were instead going to the Belfast Christian charity LIFT. The spokesperson added: "Translink supports many employees' fundraising activities for a wide range of causes within the community." Now, to an unexpected and deeply unpleasant consequence of the Primark fire. Where there is rotting food lying on supermarket shelves and fast food kitchens that can't be removed because of a safety cordon, what do you get? A "rat's paradise", according to the Belfast Telegraph. "Pest control officers have doubled their efforts to control vermin in Belfast city centre in the wake of the Primark fire amid fears that surrounding shops are rat magnets", says the paper. "Some businesses inside [the] safety cordon sell perishable stock, which has been sitting on shelves since the August 28 blaze. "But two weeks later, staff have still not been able to access shops to clear out food." It quotes pest control expert Gary Stewart, who says the rat population "could explode", as pest-control teams can't get into premises to put bait stations in place.